Perhaps you know of the music of Ukraine-born Nikolai Kapustin already. There have been a few CDs over the years to etch his niche even more deeply. Try Leslie De'Ath's article on this site as an arm's-length, in-depth appraisal by a performer who has also done so much for Cyril Scott's piano music. Kapustin has thrived under recorded attention from Steven Osborne (Hyperion), Daniel del Pino (2+2), Miguel Borrego (NPM), Sun Hee Yoo and Sukyeon Kim (Piano Classics). These four works come from the period 1998 - 2014. They're in Kapustin's hay-wagon ride of a journey that branches out into a cool promontory. It's a projection from a mainland occupied, as it were, by the likes of Jacques Loussier, Friedrich Gulda, Meyer Kupferman and Conlon Nancarrow. 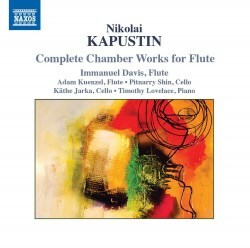 Slightly gallic, Kapustin's music swoons and accelerates the listener with a sense of propulsion only just under control. They combine a predominance of jazz blended with an element of laid-back sultriness. The track of these entertaining four 'missiles' tips, turns and mercurially breezes left and right, up and down. It's as if Debussy's Faune had come under the influence of the high priests of jazz and had given himself over to the wild excesses of Pan and Dionysus - putting the maenads and corybantes to flight. Six years separate the four-movement Flute Sonata from the three movements of the Divertissement but the style gap is hardly detectable, except that the tempo and mood is calmer in the Divertissement. A Little Duo is the most recent work here and fines the complement down to two. Here, Kapustin takes the quintessence of his style established in the 1990s and provides what amounts to a concentrated Baedeker of his creativity. More of the same? Probably … but the huskier presence of the cello has greater prominence. The Trio at times, as in the first of three movements, boasts a challenging density of texture moderated by the calming nectar of the middle Andante. The playing seems fluent and idiomatic and the recording is apt to this rightness and seeming ease of expression. Kapustin is a fascinating and engaging character. When will a company get around to recordings his six numbered piano concertos (1961, 1974, 1985, 1989, 1993 (2x)) and his host of other pieces for piano and orchestra?